I noticed Keshia and Ross make their beds in the morning. They like things tidy and it’s a nice change from some of the sloppy, dirty casts lately. James has a convo with Shannon, Mark and Metta about Big Time Rush and what happened to them. No one cares but they try to look interested. James let’s everyone know he told production they couldn’t keep his house info from him. Maybe he’s in the process of buying one. Don’t know, don’t care. Brandi refused to go to the DR until she’s given the curling iron she was promised. They talk about BB16 being given to all of them for research. Thankfully, the few who watched it arn’t using it as a how to guide. 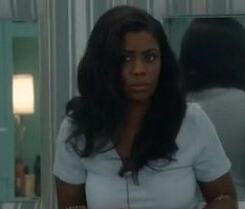 It sounds like Shannon and Omarosa did some smack talking during the hoh comp but I’m not sure. 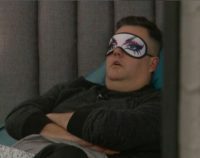 Brandi asked if the live feeds are on all day. Mark told Ross he kept trying to talk to Keshia but she wouldn’t have anything to do with him. He said she’s been that way with him all week, not only since last night. Everyone at different times have tried to talk to Keshia and said they didn’t want her to feel awkward and alone, especially with Omarosa out of the house. They’ve tried to involve her but she isn’t ready yet. Keshia has a talk with Mark, she cries a little but says it isn’t about the game, it’s over her daughter. Mark is very nice to her and she comes clean with him about wanting to put him on the block and why she wanted to do it. She tells him James always remained her target. (True) She tells him she just needed some time alone to process everything. Keshia and Metta talk and Keshia is wondering if Omarosa turned on her and set her up. She told Metta about her being a villian on The Apprentice but thought she had changed her ways. She said she told Omarosa that if she did that, the black community would hate her even more. Metta tell Keshia that Omarosa may not come back because she likes control and doesn’t have it. He says he wants to talk to production again about leaving. He explains that it’s a game and once you have a chance to stab someone in the back, you have to do it. Keshia thinks they threw the comp to Ross but Metta disagrees. She beleives the old alliance got her to do their dirty work. Metta said the spinning made him dizzy. He’s glad he didn’t come to win but if he was playing against more guys, he would’ve turned up. Keshia also said this isn’t a game for for good people. Brandi suggests they let Metta win the next hoh so he can put up Shannon and James. Brandi tells Ross it’s time for a big move. He says they just had one and he’s tired. Brandi, Ari, Marissa and Ross solidify a F4. Brandi and Ari approach Ross with the idea of putting up Shannon and James if Omarosa doesn’t come back. He says that James will be after him if they evict Shannon. They understand this but say it should be an option. None of them want to evict Metta and decide to talk about it again after veto. He asks them not to mention it to Marissa yet. Ross bring up James and Shannon being a duo to Marissa. He points out that Shannon lied to their face about her F2 deal with Omarosa. He thinks she could have one with James and tells Marissa to think about it. Marissa says she trusts Brandi and Ari the most. Metta has some make up time and does Ari’s make up. He says it’s the best day he’s had so far and is finally getting comfortable. He asks lots of questions and says he will learn to do his wife’s make up for her. He suggested a picnic for lunch too so maybe he’ll survive after all. They have an hoh lockdown but it was to put in humidifiers, not Omarosa’s return. Omarosa returns to the house. Feeds are out so maybe noms are happening. 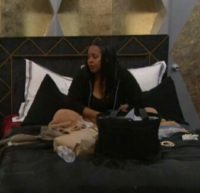 Feeds return with Shannon and Keshia talking and they discover Omarosa lied about Keshia. Ross talks game with Metta. Ross thinks he needs to go after the top dogs, Shannon and James. Ross says someone will anyway and he needs to go after a threat to himself, Omarosa. Shannon shares her information with the group after her talk with Keshia. She says that Keshia denied wanting to go home before and said today was the first day she got upset overy missing family. Shannon says Omarosa lied about all of it. While these things are coming out, here’s an update on Omarosa: She changed her arm sleeping position. I’m wondering if nominations are ever going to happen! 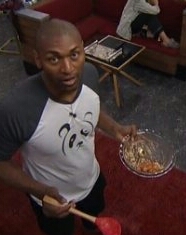 Ross talked to Keshia in the HOH, Omarosa got up, hugged everyone, went to shower and realized Metta broke something in it. 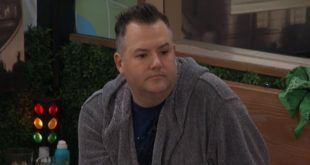 Ross talked with Marissa and said he trusts Keshia more than Shannon at this point but noms will still be Omarosa and Keshia. (Keshia already knows) If those are wrong, I’ll post an apology tomorrow but I’m wrapping it up for the day…unless Marissa actually does kill Omarosa! Metta is happy about the pie Ari is making. Omo’s return to the house. One thing Marissa IS killing……this lunch. Yet another article about CBB/Omo over at Mediaite. Wow! What a bunch of flip floppers.They’ll be putting themselves on the block before too long.They can’t keep an alliance for more then 10 minutes.They are pretty good at snacking and drinking.They have that down pretty good. “They’ll be putting themselves on the block” 🙂 That is hilarious!! 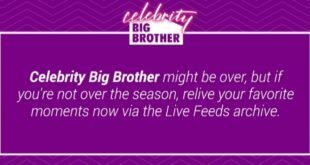 They might consider doing a triple or quadruple eviction so they can go ahead and wrap this thing up. I wouldn’t be surprised if at least one or two of them do self evict.